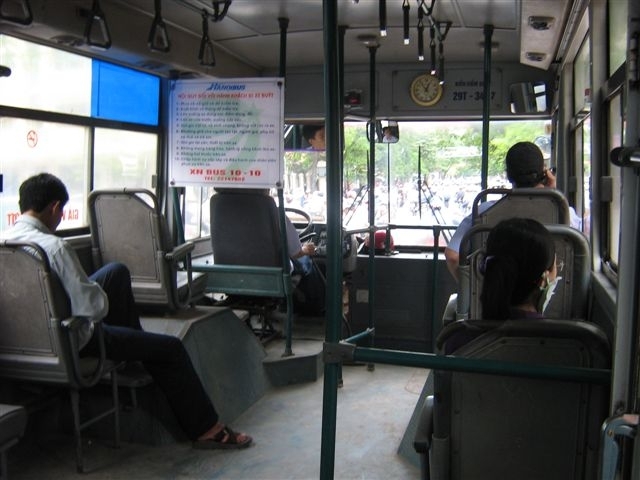 Hanoi’s public bus network is easy to use, if jam-packed at rush hour. It’s a reasonably convenient way to get around town, so long as you have some time up your sleeve. And taking a bus ride sends you on a Hanoi journey not often taken by foreigners. You are likely to find that you are the only westerner on the bus. Depending on your age you may well also be the only passenger between the ages of 20 and 60, as most of the other passengers are students or the elderly. In the same way that people in western countries prefer their cars, Hanoians like their motorbikes. The ride is certainly cheap, at 3,000 dong – about 15 cents – for most rides and 7,000 for a few longer routes, such as the number 7 out to the airport. I am often the oldest person on the bus and the conductor will sometimes defer to my age by pointing out a seat to me, or even telling a student to move so that I can sit down. Of course as a large Tay (westerner) I stand out like a sore thumb, but it’s possible to kid myself when I use public transport that I am a real Hanoian, not merely an affluent visitor passing through. People sometimes squeeze up so that a third person can fit on a two-person seat. Once an old lady moved along so that I could perch on the end of the seat – on that occasion I did feel almost like a local. It’s essential to take precautions against pickpockets . One foreigner I know answered her mobile phone on a crowded bus one morning, put it back in her bag but forgot to zip up the bag. After she got off the bus she found that the phone was gone. I always get my 3000 dong for the ticket out before I board the bus, so that no-one aboard can see where I keep my purse. The other main risk is getting off. Usually the bus slows down rather than stopping, then quickly gathers speeds. You have to choose your moment to leap from the bus in the short window of opportunity before it speeds up again. The automatic closing doors are also pretty abrupt in this nation where safety precautions are rarely considered for any activity. I know one foreigner who suffered an injury as the door slammed into his side. He had to go to a hospital in Bangkok for treatment. The website for the Hanoi Urban Transport Management and Operation Centre (TRAMOC) IS at http://www.tramoc.com.vn/. It has a useful map of the bus routes which you can download and also a list of the services with their main stops and the frequency of services. Every new Western visitor to Hanoi has many everyday matters to sort out that they do not think twice about at home: deciding what water is safe to drink, the first encounter with a squat toilet; identifying food that fits inside western comfort zones (pass on the pig-ear salad). However the initial problem the first-timer needs solve is how to cross the road. Fifteen or 20 years ago most residents got around on bicycles. Hanoi was a quieter town – and much poorer. As wealth has increased most people now drive motorbikes. Some even own cars. Yet the physical infrastructure has not kept pace with the number of vehicles crowding the roads from kerb to kerb. Many busy cross roads don’t have traffic lights, and pedestrian overpasses are few and far between. Neither have drivers‘ attitudes kept pace with traffic conditions. Some motorbike drivers treat red lights as slight impediments to their journey rather than firm signals to stop. Some zebra crossings have been painted on the roads; they are completely ignored by drivers. Even footpaths are not always safe., because at rush hour motorbikes, and even cars, take to them. In fact, it’s hard to work out what the road rules are since they are so frequently disobeyed. Yet if you waited for a break in the traffic to cross the road you could be waiting for hours. So take a deep breath, and step out from the kerb into the traffic. Walk very slowly and very steadily across the road. It works! You will find that, miraculously, the motorbikes will flow around you, like water flowing around a rock in a stream. Be sure to keep an even pace and never dart forward – the drivers are relying on you moving slowly so that they can weave around you. But keep a weather eye on the traffic and be ready to vary your pace according to the pattern of oncoming traffic. Many Hanoians, old hands at navigating through the river of bikes, don’t keep a lookout as they saunter nonchalantly across the road. They are placing a lot of faith in the alertness of drivers, who might be making a phone call, or sending an SMS with one hand as they steer their bike with the other. There were, after all, 11,060 road deaths in Vietnam in 2010. Sometimes pedestrians wave their hands, usually at elbow level, to signal their presence to drivers. This is also a common ploy among motorbike pillion passengers as the driver executes a U-turn, or crosses several lanes of busy traffic. What might at first glance seem a pointless exercise is probably effective as the sudden movements of the hand might just catch the attention of drivers. 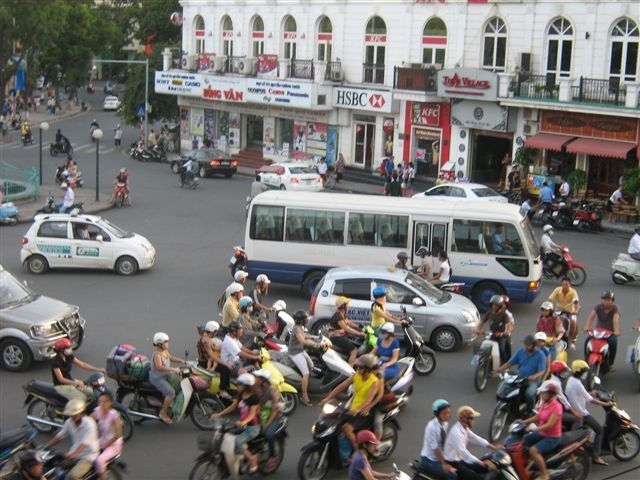 That’s motorbike traffic sorted, but there are an increasing number of buses and cars on the road, and many of the cars are four-wheel drives that barely fit down Hanoi’s narrow streets. These vehicles are far less manoeuvrable than bikes, yet their drivers often drive as if they are weaving through traffic on a Honda Wave – hopping lanes and overtaking on the wrong side of the road, always without indicating. The same applies to buses. These vehicles can be downright scary, so do wait until the road is temporarily clear of them – if not of motorbikes – before stepping out. As more and more cars clog the roads the wait for a break is taking longer and longer. To see Hanoi pedestrians in action go to YouTube and type in “Vietnam cross street” or similar search terms to see the videos posted by foreigners who have mastered the art of crossing a Vietnamese road. The Angkor temples near Siem Reap in Cambodia are the remnants of the centre of the Khmer empire, which dominated the region from India to the south of Vietnam from about 800 to 1400 AD. The best known and biggest, Angkor Wat is one of about 40 stone or brick complexes that have survived all these centuries. Just about everything else, including the royal palaces, was built of wood and rotted away centuries ago. I visited Siem Reap in early February, when the weather is relatively cool. That means it’s also the busiest time of year. However it’s still possible to visit most of the monuments when they are less crowded. The massive Angkor Wat, for example, is busy at sunrise, quieter later in the morning and early afternoon, when the many group tours head back to Siem Reap for lunch, and busier again when the tour buses return. A ‘temple mountain’, Phnom Bakheng, is packed with tourists at sunset, but was almost deserted during my early-afternoon visit. Ta Nei, shown in the photo with this post, isn’t accessible by bus and is apparently always quiet. The Angkor temples are awe-inspiring – on a par with the pyramids of Egypt, because as well as the sheer grandeur of the temples you have the countless the carvings and bas reliefs that adorn many of them. Gigantic scale is combined with beautiful detail. As you wander through the temples successive vistas of carvings, statues, pillars and galleries are revealed. 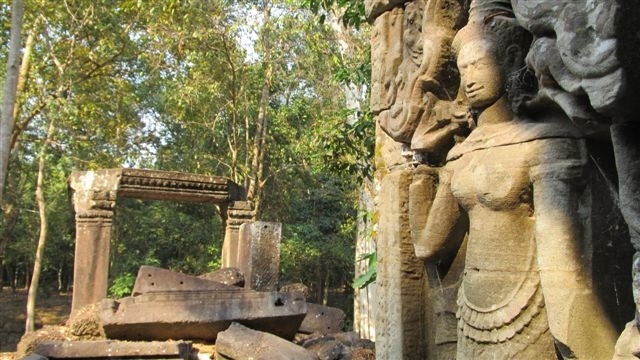 Some temples haven’t been reclaimed from the jungle, and lie in photogenic ruins – Ta Nei is one of these overgrown monuments. Clambering over giant blocks of stone, or between huge trees that have roots entwined around walls and roofs, definitely brings out your inner Indiana Jones. There are sobering moments too, if you pause to think about the countless streets, buildings and communities which surrounded these religious monuments, and which have completely disappeared. And there are sobering signs of far more recent history. The genocidal Khmer Rouge only held power for four years, from 1975 to 1979, but there are many reminders of their regime and the subsequent long years of civil war. For example at the entrance to the Bang Melea temple, across the road from a village, large signs on other side of the path proclaim that the area has been cleared of landmines. At the spectacular Bayon temple (it was used as a location in one of the Tomb Raider films) I overhead a conversation between an American family and their guide. ‘Why is the ground bumpy?’ asked the young daughter, pointing to some grassy trenches. The guide explained the temple was used as a military base by the Khmer Rouge, who dug out the trenches to use as battle stations. The advice on when to visit different temples was given to me by Pros, the tuk tuk driver I hired each day. 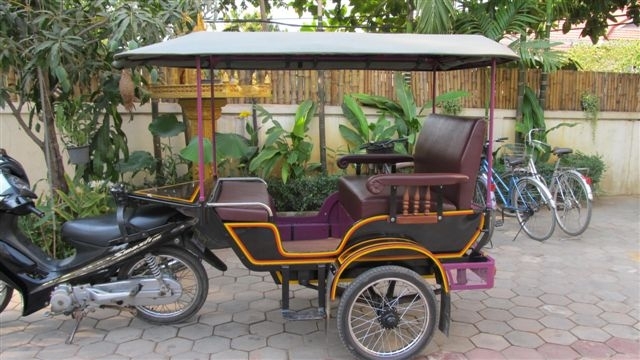 A tuk tuk in Siem Reap is a motorbike with a detachable cabin at the back for passengers. Pros was pleasant, reliable and helpful and I would certainly recommend him to other visitors. His email address is phinravuth@yahoo.com and his mobile phone is +855 (0)9745 18555. At left is a photo of his tuk tuk. I stayed at an establishment called the Kool Hotel (http://www.koolhotel.com/), which belied it naff name: the room was spacious, clean, comfortable and quiet and the staff were friendly and helpful. A substantial cooked breakfast was included in the price – just what you need before a day trekking around, through and over the Angkor monuments. International Women’s Day flowers on sale. Last week the Vietnam News ran a story about International Women’s Day. It reported that: “This year’s inflation may be a dampener on International Women’s Day, but many supermarkets and centres in HCM City have announced sales and promotions to attract ladies back to the shops.” One supermarket chain was running a promotion called “Ton vinh ve dep Viet” (Honour Vietnamese beauty) and at another chain a promotion was titled Rang ngoi ve dep Viet (Shining Vietnamese Beauty). International Women’s Day in Vietnam is like a cross between Valentine’s Day and Mother’s Day. This morning at work, I and my two female work colleagues each received a red rose from our male boss. 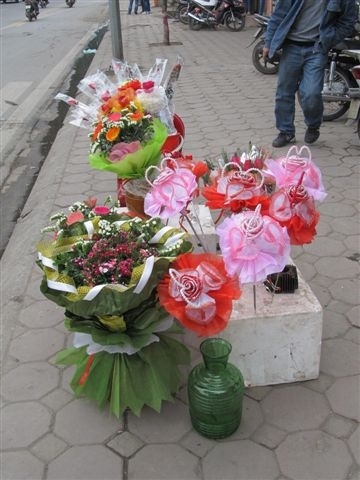 On March 8 each year, said my colleagues, men in Vietnamese offices will often buy the women they work with flowers as our boss did, and treat them to lunch as well. Husbands and boyfriends buy dinners and gifts and husbands may even tidy up the house that day. Hanoi has many beer taverns that are either open to the street or actually on the footpath, and are almost exclusively patronised by men. However, tonight a couple that I go past on the way home from work were much quieter than usual. But the florists were busy, and many street vendors were positioned by the road to sell roses from shallow baskets balanced on the seats of their bicycles. Red roses fetched around 10 times their usual price today, given the expectation that men will buy some for the women in their lives, professionally and personally. All this is a far cry from the origins of the day, as described on the United Nations’ website, as emerging from labour movement early in the last century and becoming a time to reflect on progress made, to call for change and to celebrate acts of courage and determination by ordinary women. The way the day is observed in Vietnam also contrasts with my memories of March 8 in Australia, where it’s commemoration is also firmly rooted in the labour and women’s movements and is also a day to celebrate women’s achievements as, over the past century, they have increased their choices in how they live their lives. On the other hand, the day is not widely observed and I suspect that most Australians would not be even aware of it. For a different view of women in Vietnam from the one that’s mostly presented on International Women’s Day visit the Vietnamese Women’s Museum in Hanoi, or look at its website at www.womenmuseum.org.vn. 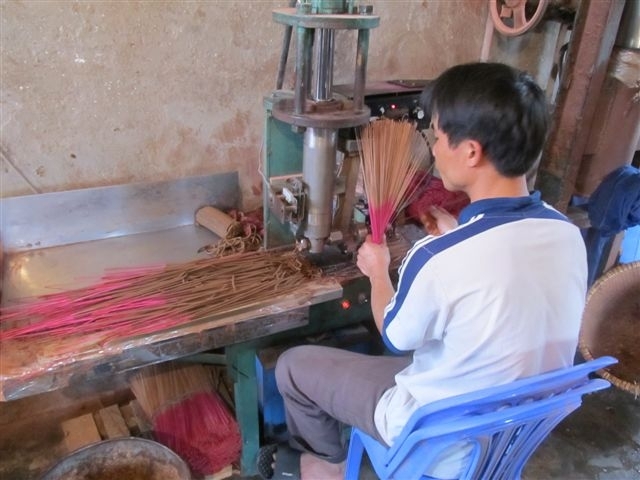 Doc La is one of the many craft villages in Vietnam where the entire village specialises in a particular product. There are, for example, silk villages, bronze villages, ceramic villages, woodworking villages, conical hat villages, rice-noodle villages and lacquer villages. Doc La’s craft is incense. I went to Doc La on an excursion with Friends of Vietnam Heritage, a not-for-profit educational group of foreign and Vietnamese volunteers n Hanoi who aim to preserve and advance Vietnamese heritage and culture. In Doc La there are signs – and smells – of its main industry everywhere. 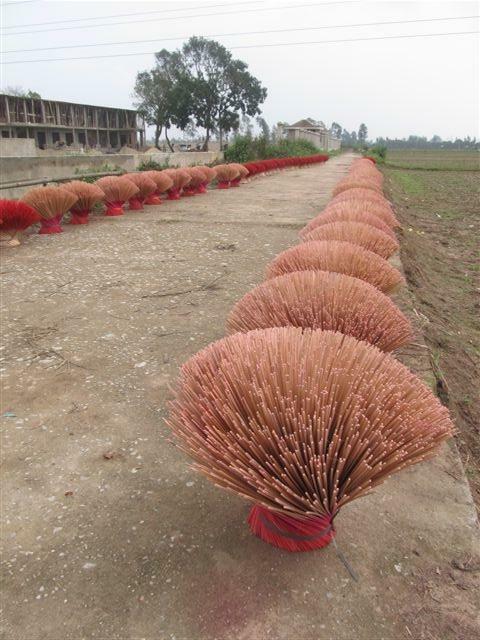 Racks of incense sticks fill yards and line roads, as do long rows of bunches of incense sticks, fanned out like flowers in a vase. 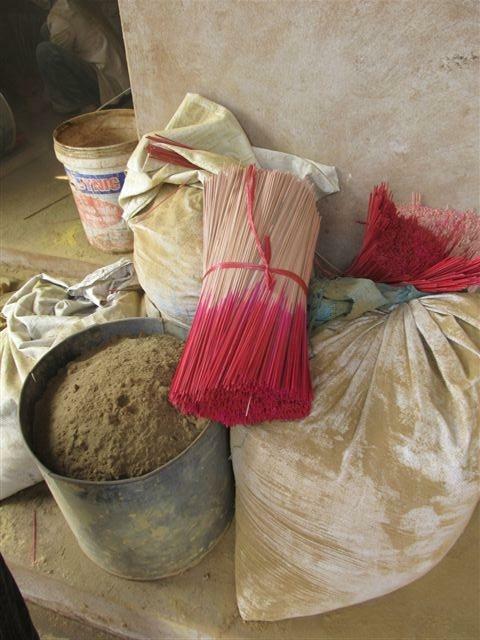 We mostly saw the long sticks of incense seen everywhere in pagodas and temples in Vietnam. We also saw incense coils drying on racks in one front yard. These are another common sight in pagodas, suspended from the ceiling above worshippers’ heads. The busiest time of year in in Doc La is the weeks before, during and after the Tet lunar new year celebrations, according to the VnnNews.net website (www.vnnnews.net), which carries an article about the village. At that time many people in this country of almost 90 million make an extra effort to pray to ancestors and other spirits – and that’s a lot of incense. We visited three family businesses. At the first business the incense is applied to the sticks by hand. A woman, squatting on the floor, as do many workers in Vietnam, dipped a handful of sticks in a pot of glue and then in a pile incense powder, then shook off the powder before epeating the process two more times, as a fine mist of incense filled the air. Her only protection from this was a cotton scarf. At the second workshop the procedure was mechanised but still labour-intensive. A worker fed the wooden sticks one by one into a machine that forced them through a cylinder filled with incense that had the consistency of dough. The sticks shot out the other side, coated and ready for drying. In the front room of a third house we visited, the owner carefully printed yellow and red cellophane covers for packs of incense, one colour at a time, on a simple silk-screen printing press. On the way back to the bus some of us bought packs of incense from one local producer for 8000 dong a pack. I discovered during the journey back to Hanoi that we had paid a heftier “foreigner’s tax” than usual: a Vietnamese friend on the same excursion told me he had helped some of our fellow day-trippers to buy incense for just 2000 dong a pack. Still, even 8000 dong is only 45 cents. This morning I left my home at quarter to nine to meet the motorbike driver who takes me to work, and outside the front door of my building walked straight into a wedding party. It was being held in a long narrow marquee erected in the laneway outside my building. The lane was only slightly wider than the marquee, leaving just enough room for me to walk through. At the far end of the marquee I inadvertently got caught up in a wedding photo (I’ll be the Tay (westerner) scurrying through the guests at the far left of the shot), after which I weaved my way among a group of women wearing beautiful scarlet ao dai, before finding my motorbike driver. Ao dai are the traditional costumes consisting of long, tight-fitting silk tunics worn over loose trousers that Vietnamese women don for special occasions. I could not see the bride in the throng of guests as I departed by motorbike, but she was actually more likely to be wearing a flounced western wedding dress than an elegant ao dai, judging by the many wedding photos I have seen taken at beauty spots around town. Most weekends I see a few couples having their wedding photos taken, and sometimes several in the same spot. The photos are not taken on the day of the wedding, but weeks, if not months ahead, so that they can be displayed on the big day. My favourite sight from one of these photo shoots was a bored-looking groom-to-be trailing his fiancée as he carried her high-heeled shoes. A quarter to nine on a weekday morning might seem a strange time for a wedding party, but I was told by a Vietnamese work colleague that both the date, and the time of day, of the wedding are carefully chosen by the couple and their families after consulting a fortune teller. Believing in supernatural forces is common in Vietnam, and those forces are held to affect people’s lives in many ways. This morning may also have been a particularly auspicious time for a wedding as it immediately followed the 15th day of the first lunar month of the lunar year (the Tet new year festival falls on the first day of that month). My colleague told me that the 15th day after new year is a very important time for the worship of ancestors, with people holding big family dinners and visiting pagodas to pray, leave offerings and ask deceased parents and grandparents for help in this world. Last night I also saw people burning paper money on the street, to send to their ancestors – another example of the pervasive beliefs in a spiritual world, and in its everyday links to the material world. 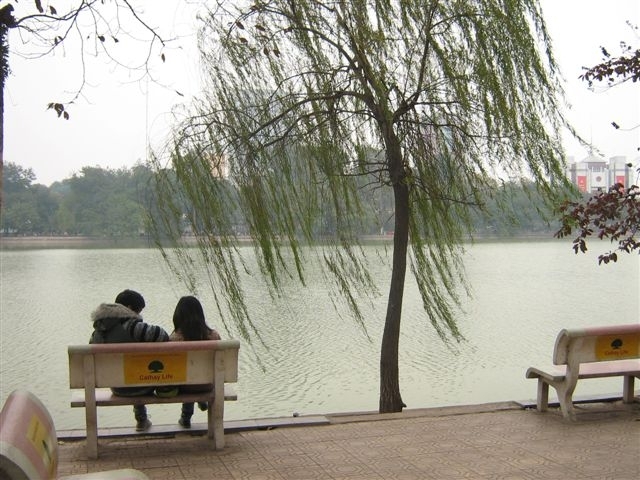 Hanoians are chilling out in north Vietnam’s short, but bitterly cold, winter. In January the temperature rarely got above 12 or 13 degrees, and due to the moisture in the air the cold seeped right into the bones. In the mountains north of Hanoi many thousands of cattle and buffalo died in mid-January as the temperature dropped to record lows. The traditional peach blossom branches and potted cumquat trees that decorate homes and offices during Tet, the lunar new year celebration, in late January, doubled or tripled in price from last year. Trees just weren’t blossoming in time. It’s not like a European or North American winter, of course, but most people don’t have heating in their homes, which are built for the heat that prevails for the rest of the year. There have been reports of deaths due to carbon monoxide poisoning when people took coal braziers inside and close the doors. In homes, shops and restaurants across Hanoi residents, shop assistants, customers, waiters and diners pile on jackets, coats and scarves to keep warm. On the coldest days hndreds of schools, also unheated, closed their doors . My office is heated, but not enough to keep my hand warm as I work on the computer. So I went off to a shop known to foreigners as “the Russian shop” in search of fingerless gloves I could wear while typing. The Russian shop is so called, apparently, because it was the only shop in town selling western-size clothes, imported from Russia, in the days of the US trade embargo (which ended in 1994). Now it sells brand-name leisure jackets and coats made in Vietnam for export to the west. I could barely shoehorn myself into the small shop, jam-packed with clothing piled high on benches and stuffed on racks, all being picked over by Vietnamese and foreigners who had lost all sense of personal space. The shelves with hats and gloves were near the door, and, as fortune would have it I found a warm pair of woollen fingerless gloves (shopping’s often a lucky dip in Hanoi), and beat my retreat. Hanoi’s busy footpaths have a Dickensian feel at any time as people eat huddled over small tables sitting on even smaller stools, street sweepers wield their brush brooms, shopkeepers’ wares spill out onto the pavement, and craftsmen practice their trades in the narrow strip between the fronts of homes and shops and the road. Now small fires, fuelled by scavenged scraps of wood, also dot the streetscape. And out on the crowded roads it seems like every second motorbike is driven by a man with one hand nestled warmly in his pocket.